Chatting is the most commonly used feature of Internet by the youth and common people. It allows us to comment with our colleagues and relatives or even can make new friends over internet. And, there are many Internet and Software companies provides online chatting facility. Now, We are going to familiar to you a new chatting software 'WeChat' developed by 'Tencent' which is suitable for all most all smartphones including Android, iOS, Symbian ( V3 & V5 ), and Windows ( Blackberry version is coming soon). It supports currently 17 languages including English, Hindi, Spanish etc.. and supports Wi-Fi, 2G, 3G and 4G data. The main feature of new Wechat 4.3 ( Latest version ) is, it supports voice and video calling, Group voice messaging, Moments( sharing including text, photo, video & URL ). Few Words About Tencent Company. 'Tencent' is the largest Internet Company in APAC with almost 800 million active users. Its the third largest Internet Company globally in terms of investment Capitalization. 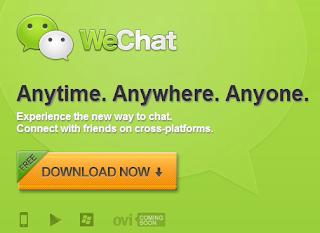 They launched WeChat Internationaly (iPhone) on October 27, 2011. As we said earlier, WeChat is a free mobile communication and social networking app for smartphones with features like Video/Audio calling, Push-To-Talk Voice Messaging, Group Chat-Text & voice ( upto 40 people ) and location based friend discovery social features ( shake). It can download and install from Google Play Store, Nokia store and Windows market place at free of cost. We chat also provides a Rock-paper-Scissors mini game, customizable backgrounds, and engaging one-on-one and group session with an extensive range of Animated and custom emoticon and emoji art. Also provides to apply artistic filters to photos and share with your friends on Chat and Moments wall. WeChat provides a fast and secure social networking access. Protects your data by on-demand data backup and retrieval to/from its cloud based server. And also user registration is much simple by SMS/Voice messaging service. The above mentioned features are the key benefits of WeChat App from other leading chatting apps such as Nimbuzz etc.. They donot provide such fastest and secure user experience. Shake : Exchange contact information with nearby WeChat users, or connect with WeChat users worldwide and to be friends with them. Look Around : Discovers WeChat users near you. One of the upcoming feature of WeChat is, Powerful Open API. with this feature, users will be able to allow share photo, music, video, games, new and other kind of social network from other third party Application plugins.